Creation of a start-up cargo carrier called Sky Gates Airlines, which will be based at the newly opened Zhukovskiy Airport near Moscow, was announced at the airport’s opening ceremony. Russian Aviation Insider talked to the new airline’s general director Pyotr Morozov to find out some details. Morozov left the top-management position at iFly charter carrier in April 2014, after which he became involved in several aviation-related projects. He told Russian Aviation Insider that Sky Gates Airlines launched formal procedures for obtaining an Air Operator Certificate this week. 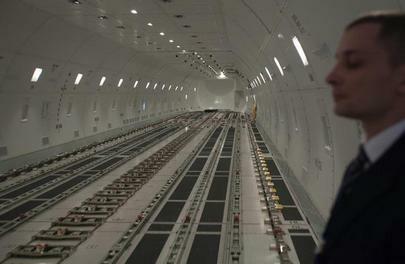 The carrier expects to make the first commercial flight in September. This year, Sky Gates Airlines will lease one cargo Boeing 747-400F. In 2017, it will expand its fleet with two more aircraft of the same type. After a cargo terminal in Zhukovsky enters service, which is expected to happen in the fall of next year, Sky Gates Airlines will consider increasing its fleet to six aircraft. The two projects – the airline and the airport – are tied together, but until the cargo terminal becomes operational, the carrier will operate out of other airports. Its route network will include both domestic and international destinations, with an emphasis on Southeast Asia. Morozov mentioned that Sky Gates Airlines employs former pilots and engineers of Transaero. He declined to disclose the investor. According to Russian registration entities, Sky Gates Airlines was registered in Moscow in April of this year. It is controlled by Sky Gates Rus company, 20% of which is owned by Globus Distribution Management, and 80% by Alexander Khmelevskikh. A representative of Avia Solutions Group confirmed to Russian Aviation Insider that the Lithuanian business structures are involved with the Sky Gates Airlines, but refused to comment, saying it is still too early for comments. Avia Solutions Group owns 75% (less 1 share) of Ramport Aero, the operator of Zhukovsky’s passenger terminal.